I was glued to the TV as a kid in the 1970s whenever the campy Batman show starring Adam West and Burt Ward would come on. 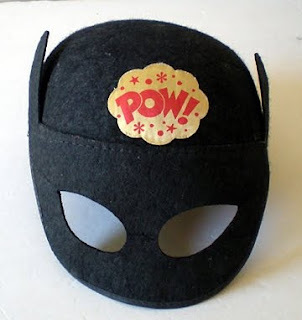 After a long, Batman-less dry spell, two fantabulous things happened: our local station started airing Batman reruns last week, AND today I found this ABSOLUTELY INCREDIBLE VINTAGE BATMAN POW! HAT!!! I'm going to wear it every evening when I watch the show...and possibly to work. I love vintage space toys from the 1930s - 1950s. The unique imagery from this time is at once both futuristic and nostalgic, space-age meets Art Deco, resulting in a sort of "toys of future past" appearance. Here are a few of my favorite pieces. First up is this amazing ray gun (given to me by Christine of The Daily Postcard: thanks Christine!). Even though it isn't terribly old, it has, I think, a great "Forbidden Planet" look. Next are a couple of 4 inch Archer Space Men, made in the 1950s, but with a look that seems much earlier to me. They're almost sculptural in quality, with a lot of Art Moderne in their styling. They're also a bit reminiscent of Communist Bloc civic statuary, aren't they? The pointing guy has lost a hand, but they were a yard sale steal at ten cents, so I'm not complaining. And here's my most recent find: a homemade child's pajama top from the 1950s with absolutely fantastic graphics of spacemen, satellites, and rocket ships. Some lucky little boy clearly loved this, and so do I! The pajama top is modeled below by my 20 inch 1940s cinnamon Gund bear. He loves it too. Today I found one of the toys of my dreams: an antique rocking horse. As with my mechanical coin-op horse, I've wanted an antique rocker forever, but their typically large size has always been a problem in my small, crowded place of residence. 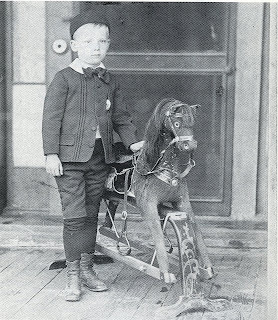 Now, however, I've found this little beauty: a kiddie sized American horse, probably made by Whitney Reed, dating between 1900 and 1915, and measuring only 28 inches high by 31 inches wide. It's the perfect size for a large teddy bear, and I have several who are already lining up for their turns. Update, one week later: I've just found some original advertising for my horse! It turns out his frame design was patented in 1878 by Philip J. Marqua and Brothers, a family woodworking firm in Cincinatti, Ohio. 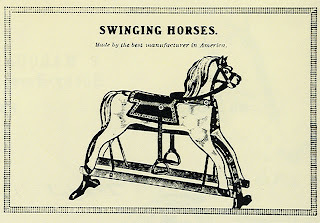 The Marqua design was known as a "swing stand", with this variation called a "center swing horse". It was created as an alternative to the bow shaped rocker of the classic rocking horse, and was intended, in the words of its creator, to prevent "the objectionable features" from these traditional horses "now in use -- these objections are noise, wear and tear of carpets, liability to upset, and too much room taken up for operating or packing for shipment." These were all common problems with large horses on traditional curved rockers, which made a racket as they swept back and forth along wooden floors, eventually wore a track into carpets due to the same motion, took up a large amount of space, and frequently flipped over during energetic rocking. And here's a photo of a horse on the same frame, dating from 1914. This horse is different, it looks like it may be a skin horse, but the interesting thing is that the frame is just like mine: painted and stencilled on the large central support bar, but not on the side rails. I had wondered if my side rails were replacements since they didn't have the red paint of the rest of the frame, but this photo answers that question. Based on this ad and photo, I think my horse is all original except for his stirrups, which I'll be removing. 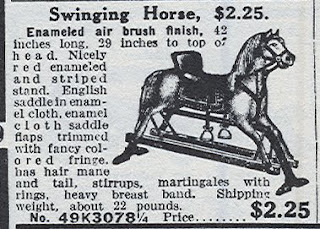 Here's another ad for my horse, this one from the 1914 Butler Brothers catalog. This horse is attributed to Whitney Reed, and is almost identical to mine. This little playset, a carved wooden village with a man and some animals, represents 400 years of toymaking history. Little villages like this one have been made in Germany for centuries, turned out originally in the cottage industries that flourished during the long cold winters in regions like the Erzgebirge and Groden Valley. Seriously though, if you'd like to learn more about the history of these toys, there's a great account in one of my favorite toy books, Toys Through the Ages, by Dan Foley. I'm always amazed when I find a fragile paper toy that has survived through long years of play, and this just may be the most amazing such toy I have. Made from the late 1800s through the early 1900s as an advertising premium by the J P Coats Company (now the Coats & Clark Company), this 6 inch paper doll is really 12 toys in one.There's a different doll printed on each side of the figure, with 3 different heads for each doll concealed on a rotating wheel within its body. Beautifully lithographed, it's a charming toy as well as a very clever one. The picture below shows the changeable head mechanism. I got my first vintage Barbie doll this past year, in honor of her 50th birthday. I thought it would be enough to just have one doll, or a few, but I found it hard to resist adding a house. After all, I reasoned, they can't be very comfortable piled on top of each other in their carrying cases. So, after much deliberation, we took out a mortgage on a 1962 Barbie's Dream House, the first of many domiciles made for the iconic fashion doll and her friends. Constructed entirely of cardboard, the Dream House is huge, measuring 26 inches wide when closed. It unfolds into a classic mid-century home, complete with fold-up cardboard furniture of surprising sturdiness, and lots of accessories, including records, an incredibly cool floor lamp, a big ol' TV and hi fi, and a framed picture of Ken. In December, I wrote about getting my first ever Barbies for Christmas this past year. I never liked Barbie as a child, but became interested in her during her 50th birthday hoopla last year. I decided I needed "just one" for my toy collection, reasoning that no generalist toy collection could be complete without a representative Barbie. Well...it turns out Barbie is quite addictive! I now had one of the early ponytail Barbies, yes, but what about the Bubblecut, or the Twist n Turn, or the Mod dolls, or the houses, or cars, or Ken?! Gah!!! "Just one" Barbie has now turned into seven so far, with the addition of these mid 1960s Mod period dolls. The long haired girls are Twist n Turns with the "new, youthful face" and "real eyelashes" that replaced the molded eyelash, vampy-looking early Barbie. The two short haired dolls have Hair Fair heads, disembodied craniums that were sold separately with wigs and wiglets, to swap out on your existing Barbies. I love their cute bobbed hairdos. I haven't been able to post much so far this month: been too busy (undecorating from Christmas) and sick (a wicked cold) and tired (from both). 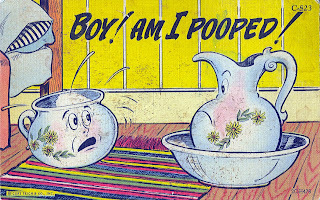 On my first antiquing foray of the new year, I found this vintage postcard titled "BOY! AM I POOPED!" that seemed a fortuitous find. Dating from 1957, it was sent by a couple of soldiers to a friend back home. The message reads: "Hi Kilo. Curly + I went to the races Sunday. Had a big time. Got loaded as usual. Hope you are O.K. Will be down to see you one of these days. 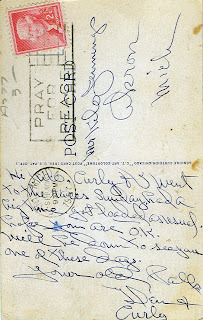 Your old pals (illegible name) + Curly." I've been racking my brain trying to come up with a thematically appropriate toy to begin January's postings. After much thought and poking about in various cupboards and boxes, I found it: this small Schuco bear. 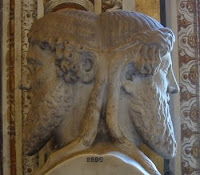 But first, a few words about Janus, the Roman god who symbolized transitions, passages, beginnings and endings, and whose image, of a head with two faces looking in opposite directions, was affixed to ancient gates and doorways. Here he is, in a statue currently held by the Vatican. Our month of January is named after him, as is this little bear, the Schuco Janus bear. To change from one face to the other, you just turn a small knob at the bear's base, and a rod within his head swivels accordingly. You can see the mechanism in this last picture, as well as a glimpse of the two faces. The Schuco Janus bear is highly sought by collectors, and deemed "freaking creepy" by pretty much everyone else. 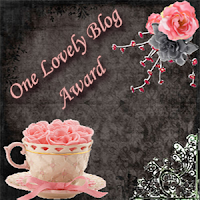 Holy Crap: I Won an Award! Hmm...it's pretty and all lady-like, what with all the flowers and teacups and gentility and such. I suppose in hindsight my post title is not the most appropriate response. Regardless, many thanks to Christine at The Daily Postcard for the nomination. Christine has a really fab site, which, as its name suggests, is indeed updated daily. With really cool old postcards. Go check it out!